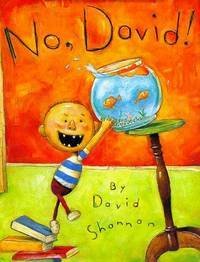 Home > Shannon, David > No, David! 1998-04-07. New. Ships with Tracking Number! INTERNATIONAL WORLDWIDE Shipping available. Buy with confidence, excellent customer service! 2018-08-28. New. Ships with Tracking Number! INTERNATIONAL WORLDWIDE Shipping available. Buy with confidence, excellent customer service! 2000-06-09. New. Ships with Tracking Number! INTERNATIONAL WORLDWIDE Shipping available. Buy with confidence, excellent customer service! Everest De Ediciones Y Distribucion, 1999-01-01. Hardcover. Used:Good. New York: The Blue Sky Press, 1998. Hardcover. Quarto; VG/VG; hardcover; dotted green, white and orange spine with black text; dust jacket has clear, mylar protective covering; boards are strong and text block is clean; 32p. FP New Rockville Stock. Fher. PAPERBACK. 842418114X New Condition. . New. Scholastic. PAPERBACK. 0590930036 New Condition. . New. 2000-06-09. Good. Ships with Tracking Number! INTERNATIONAL WORLDWIDE Shipping available. May not contain Access Codes or Supplements. May be ex-library. Shipping & Handling by region. Buy with confidence, excellent customer service! 2018-08-28. Good. Ships with Tracking Number! INTERNATIONAL WORLDWIDE Shipping available. May not contain Access Codes or Supplements. May be ex-library. Shipping & Handling by region. Buy with confidence, excellent customer service! The Blue Sky Press, 1998. Hardcover. Very Good/Very Good. 1998. Unpaginated. Signed by the author. Pictorial dust jacket with black lettering over matching boards. Clean pages with firm binding. Colour illustrations throughout. Mild wear to spine, board edges and corners. Unclipped dust jacket. Mild wear to edges and corners. Sticker to front. New York: The Blue Sky Press, 1998. First edition, first printing. Fine (as new) in original glossy pictorial boards and fine pictorial dust jacket.. Thin quarto. Unpaginated. Fully illustrated with reproductions of color drawings by the author. Condition: Fine (as new) in original glossy pictorial boards and fine pictorial dust jacket. Blue Sky Press. Hardcover. 0590930028 . New. 2013. Blue Sky Press. Hardcover. 0590930028 New Condition *** Right Off the Shelf | Ships within 2 Business Days ~~~ Customer Service Is Our Top Priority! - Thank you for LOOKING :-) . New. Scholastic Hippo, 2006-02-20. Paperback. Good. Scholastic. PAPERBACK. 0590930036 Like New Condition. . Fine. Fher. PAPERBACK. 842418114X Like New Condition. . Fine. Fher, 2009-11-02. Paperback. Very Good. Minor wear, mostly around the edges. Name crossed out inside.. Unconditional money back guarantee. Blue Sky Press, 1998-09-01. Hardcover. Used:Good. In Stock. Always but with confidence. Blue Sky Press. Hardcover. B000JGWDNM . New. Blue Sky Press. Hardcover. 0590930028 Special order direct from the distributor . New. Blue Sky Press. Hardcover. B000JGWDNM Remainder mark . Fine. Blue Sky Press. Hardcover. B000JGWDNM signs of little wear on the cover. . Very Good. Blue Sky Press. Hardcover. B000JGWDNM Minor shelf wear . Very Good. Scranton, Pennsylvania, U.S.A.: Blue Sky Pr, 1998. No, David! by David Shannon.. Hardback story/picture book has minor imperfections-overall is clean and in good to very good condition with like dust jacket in a Brodart protector-looks nice. Jacket has a somewhat worn Caldecott Honor Book seal on front. NOT AN EX-LIB!. Hard Cover. Good to very Good/Good to Very Good. Scholastic Inc., 2003. Hardcover/gebunden. fast wie neu! ISBN 0439129656 A mischievous boy is depicted doing a variety of naughty things for which he is repeatedly admonished, but finally he gets a hug. Blue Sky Press. Collectible - Very Good. Signed Copy Collectible - Very Good. Signed by author on bookplate on title page. Blue Sky Press, 1998-09-01. Hardcover. Used:Good. Blue Sky Press. Hardcover. 0590930028 . New. New York: Blue Sky Press / Scholastic, 1998. Hardbound	. 2nd Printing. BINDING/CONDITION: pictorial boards; a Near Fine book, with a Very Good+ dust jacket; publisher's price on the jacket flap is intact. Marvelously entertaining color illustrations show a young boy doing the things children do that so try their mother's patience. about 11.25 inches tall by 8.75 inches wide	about 30 pages (unpaginated). Orange endpapers. The Blue Sky Press. BOARD BOOK. 1338299581 . New. 2014. Blue Sky Press. Hardcover. 0590930028 Remainder mark . Fine.